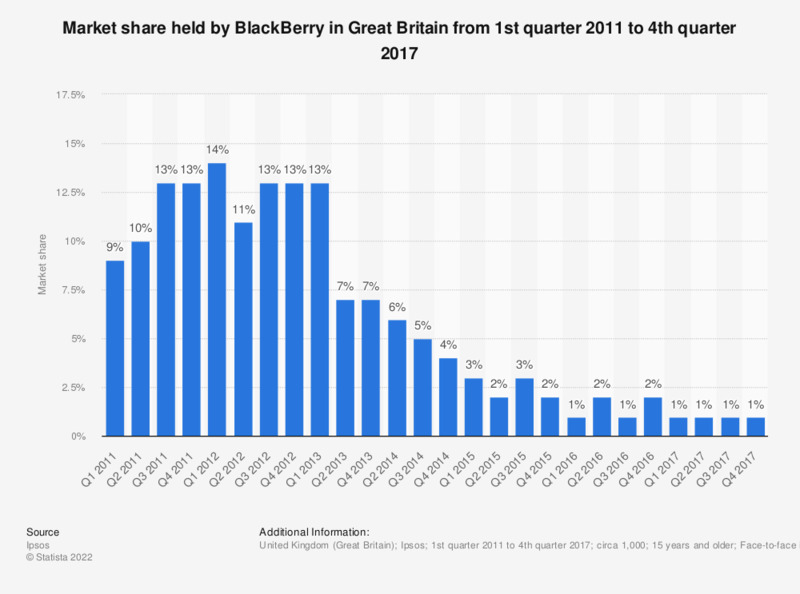 The statistic shows the market share held by BlackBerry in Great Britain from the first quarter of 2011 to the fourth quarter of 2017. The number of survey respondents with a BlackBerry phone in the first quarter of 2012 was 14 percent. BlackBerry penetration fell to one percent in the fourth quarter of 2017. Blackberry is a line of smartphones, tablets designed and marketed formally by Blackberry Limited, and now they are designed and manufactured by TCL Communication. Blackberry smartphones operated on Blackberry OS, which in turn held a slight share of the market share of mobile operating systems in the United Kingdom (UK).